What do you do about a mass extinction if you are an environmental campaigner, conservation group like WWF, or a politician, or a concerned human being? I’m not talking about a warning or a threat but an outcome: it’s happening, indeed some of it has already happened. We are living in the foothills of a new Heat Age and its wiping out the nature we rely on, as David Attenborough warned at the UN Climate Conference in Poland in December. The cause is climate change. In the early days of the industrial revolution they took canaries down coal mines and if they died, it was time to stop digging. Now we’ve taken entire ecosystems ‘into the coalmine’ and thousands, probably millions of species are dying but we’re still digging. ‘The insect population that once provided plentiful food for birds throughout the mountainous national park had collapsed. On the ground, 98% had gone. Up in the leafy canopy, 80% had vanished. The most likely culprit by far is global warming’. He points out that similar changes have been found in German nature reserves and the ‘virtual disappearance of birds in an Australian eucalyptus forest was blamed on a lack of insects caused by drought and heat’, while ‘Lister and his colleague Andrés García also found that insect numbers in a dry forest in Mexico had fallen 80% since the 1980s’. “We are essentially destroying the very life support systems that allow us to sustain our existence on the planet, along with all the other life on the planet,” said Lister. Carrington’s report is hard to find in The Guardian. It’s buried in an obscure ‘environment’ section. The top 10 most read stories all focus on Brexit. 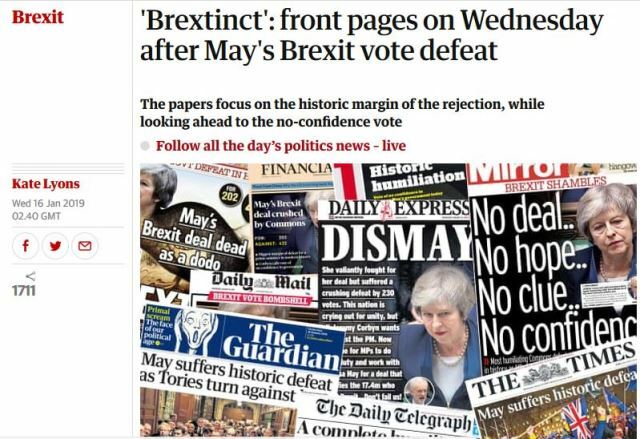 The ‘paper uses ‘Brextinction’ to sum up the implications of an historic Parliamentary vote over ‘Brexit’, and the focus of the press and political classes. One says ‘May’s deal is as dead as a dodo’. It’s logical to say that #ExtinctionRebellion are right and there are more important things to focus on than Brexit. But that doesn’t necessarily help bring about the right changes to limit or maybe one day start to reverse the mass extinction. Because for that we need the attention of politicians, and for that we need public understanding. Calling an emergency only has a useful effect if it’s understood. Otherwise you look like Chicken Little. Established NGOs should work to explain and support what activists like Extinction Rebellion are doing. Carrington is spoilt for choice in news from the apocalypse front. Also yesterday he wrote an article headed ‘Immediate fossil fuel phaseout could arrest climate change – study‘. 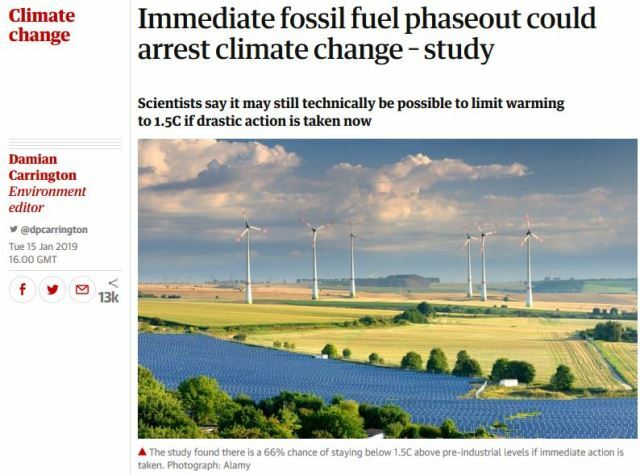 The caption explains the story: technically we could quickly replace coal, oil and gas burning by greening our energy systems, and fast enough to stay inside the 1.5C ‘danger level’, although the current 1.0C additional heat is clearly already causing catastrophic change. ‘This is better news than the headline makes it sound. The lifetime of fossil fuel infrastructure is arbitrary & retiring it early & replacing with negative cost efficiency or low cost renewables would boost the economy. It’s the politics we need to change’ . Carrington’s article is topped by a photo of wind turbines. Ironically, I’ve spent the last month or so researching how onshore wind, Britain’s cheapest form of renewable energy, was stifled by a campaign driven by politicians such as Chris Heaton-Harris MP, an arch-Brexiter who to turned the government against wind by playing on the values-driven competition for votes between UKIP and the Conservatives, which also led to the vote for ‘Brexit’. He’s now a Minister in the ‘Department for Exiting the European Union’. Politics, pollution and mass extinction of insects, birds and everything that depends on nature, are all intertwined. Conservation planners can’t cope directly with a mass extinction. Just a few species can be bred in captivity like canaries. Only a tiny minority can be saved in seed banks, zoos and by translocation to ‘parks’ and reserves. But like emergency services arriving at a disaster scene, planners can try to apply triage. Don’t bother with those who will die anyway. Give second priority to those who may be suffering but will survive. Give first priority to those whose life is threatened but who you might save by intervening. In this case it may mean looking for ‘refugia’, places which may remain cool enough for some tropical ecosystems to survive more or less intact in the Heat Age, just as tropical forests ‘retreated’ to relatively small warm and stable ‘refugia’ in the Ice Age. But that also requires protecting them from clearance of land for farming, plantations or by logging: a tall order. It’s the overall stability of tropical conditions which allowed them to evolve into intricate diverse ecosystems which hold most of the world’s diversity of life, and which may (and it seems, does) make them exquisitely vulnerable to that stability being disrupted. 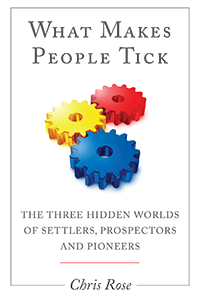 Certainly their species have far more exacting needs than most of those in temperate climes. The only way to save as much life as possible is to stop the causes of climate change.